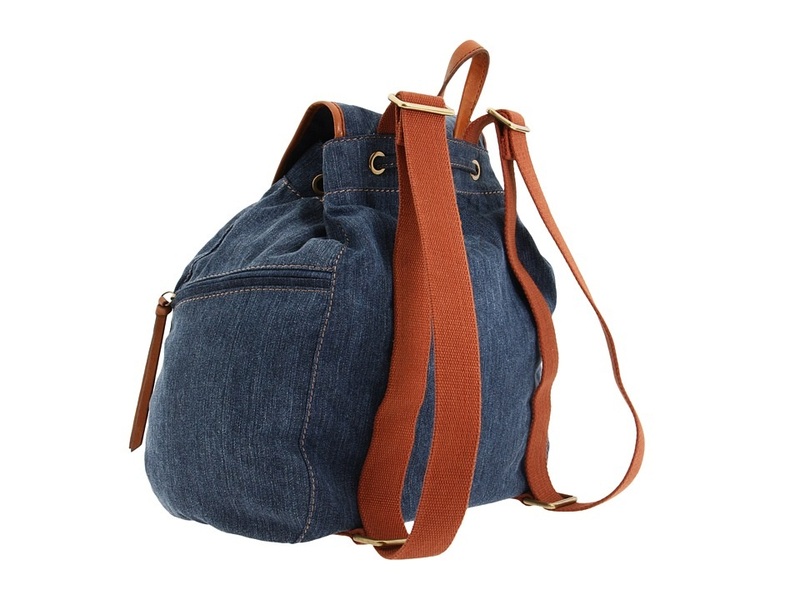 Around campus or across the country, make the journey more beautiful with this vintage-inspired backpack. Dimensions: approximately 14” high X 12” wide X 7” deep (35.5 cm x 30.5 cm x 18 cm) with grab handle with dual adjustable 17” (43 cm) shoulder straps for versatility and exterior flap and zip pockets at the front and sides. Construction Method: Turned finish – this method may be recognized by noting the lack of machine-stitching that is visible at points of assembly on the exterior side of the bag. This is possible by placing the material, or parts, face to face, machining and turning right-side out. It is the most commonly used assembly process. Topstitching adds a decorative element while reinforcing all seams for durability. 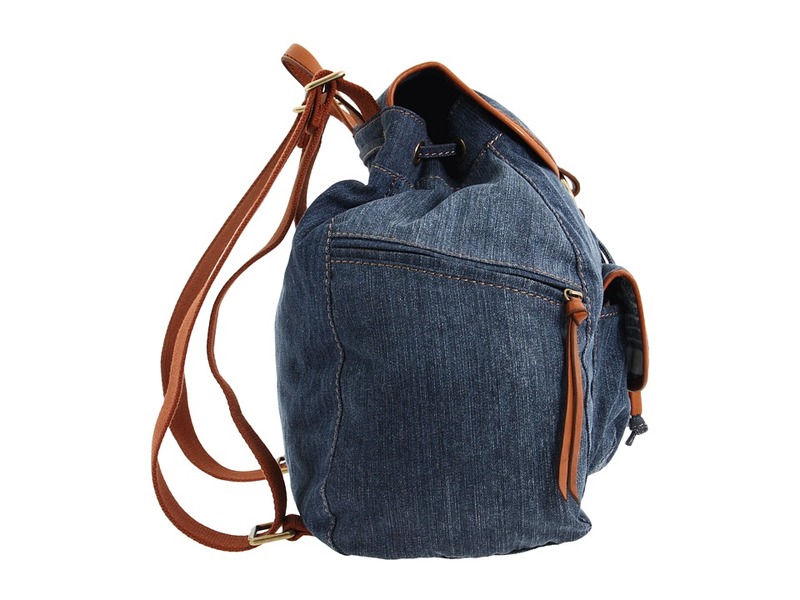 Material Used: 100% cotton denim canvas, 54″ wide; trim: pigskin leather; lined-interior features a back wall zip pocket and front wall slip pockets, made of 100% cotton ticking. Design Tip: Match the hardware and zipper metals in colour and metal finish for a sleek unified look. Colour coordinate your choice of trim with the bag strapping to achieve further harmony in your design. The draft and formation of this backpack is based upon a simple flat grid, which fits into a square or rectangle, of which the size depends on the drafting scale. ** Add seam allowances to all pattern pieces, except pocket flap and bag flap. On kraft paper, plot a straight line vertically from A to B; AB = 2 X scale minus 2″ (5 cm). Square (90 degree angle) a horizontal straight line from A to C; AC = 20″ (51 cm). Square across from B and down from C to locate D. ABCD is a rectangle. 1 from A = half the distance between AB; square across to locate 2. 3 from 1 = 2 X scale minus 2″ (5 cm). Square up and down from 3 to locate 4 and 5. Square up and down from 6 to locate 7 and 8. 9 from 7 = 1/2″ (12 mm). Join point 9 to point 6 with a straight line. 10 from C = 1/2″ (12 mm). Join point 10 to point 2 with a straight line. This is the pattern for the side lining. Label cut 2X lining. 11 from A = 1/2″ (12 mm). Join point 11 to point 1 with a straight line. 12 from 4 = 1/2″ (12 mm). Join point 12 to point 3 with a straight line. Point 13 is located midway 11 and 12; square down to locate 14. This is the pattern for the back section. Label cut 1X self. The same draft may be used for the Front and Back Lining. Trace off and label, cut 2X lining. Trace off the draft onto kraft paper. 15 from 6 = 2″ (5 cm). Join point 15 to point 2 with a straight line. Cut on line 15-2 to create the Upper Side and Lower Side pattern pieces. Label the Upper Side cut 2X self. Label the Lower Side Cut 2X self and cut 2X lining (pocket bag). Point 16 is located at the intersection of lines 1-2 and 13-14. Point 17 = the distance between 1 and 16 minus 2″ (5 cm). Point 18 = the distance between 16 and 3 minus 2″ (5 cm). This is the placement line for the front bellow pocket. Points 19 and 20 are located 3/8″ (1 cm) above points 17 and 18. This is the placement line for the front pocket flap. This completes the draft for the front pattern. Label cut 1X self. Square (90 degree angle) a horizontal straight line from A to C; AC = 2 x scale minus 2″ (5 cm). 1 from A = 1/2″ (12 mm). 2 from 1 = 2″ (5 cm). 3 from C = 1/2″ (12 mm). 4 from 3 = 2″ (5 cm). Points 1-2 and 3-4 are the placement points for the connector ring tabs. Point 5 is midway between B and D and marks the centerfront (CF) of the bag. Trace off points 14, 16, 17, and 18 from Front pattern draft onto kraft paper. Square down from points 17 and 18; and across from point 14 to locate A and B.
C-D is equidistant from 17-18; C-17 and D-18 = 1/2″ (5 cm). E from 14 = 1″ (2.5 cm). Square across from E to locate F at intersection of 17-A. Square across from E to locate G at intersection of 18-B. H from G = 1″ (2.5 cm). I from F = 1″ (2.5 cm). Join D-H and H-B with a straight line. Join C-I and I-A with a straight line. Draw a tangent line from G at a 45 degree angle. J from G = 1″ (2.5 cm). Join J to B and H with a straight line. K from F = 1″ (2.5 cm). Join K to I and A with a straight line. 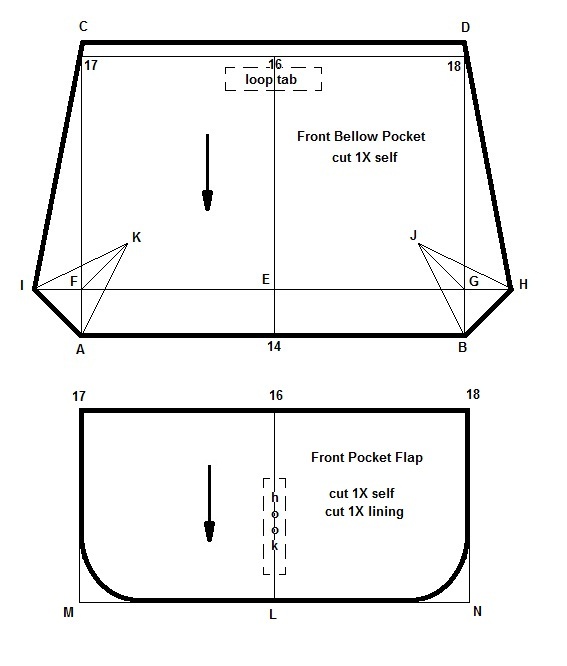 This is the pattern for the bellow pocket. Label cut 1X self. Mark placement location of hook & loop fastener (at center) about 1/2″ (12 mm) from point 16. Trace off points 16, 17 and 18 from Front pattern draft onto kraft paper. Square down from 16 to locate L; L from 16 = 3/4 of scale. Square down from 17 and 18; and across from L to locate M and N at the intersections of the lines. Gradually round off the corners at M and N.
This is the pattern for the Front Pocket. Label cut 1X self and cut 1X lining. Indicate the placement of the hook & loop fastener at center approximately 3/8″ (1 cm) above L.
Trace off points 11, 12, and 13 from Back Pattern draft onto kraft paper. Square down from 13 to locate P; P from 13 = scale amount + 2″ (5 cm). Square down from 11 and 12; and across from P to locate Q and R at the intersections of the lines. Gradually round off the corners at Q and R.
This is the pattern for the Top Flap . Label cut 1X self and cut 1X lining. Indicate the placement of the clasp at center approximately 4″ (10 cm) above P.
Draw an oblong shape on kraft paper. The length = 2 x (distance between 11 and 12 + distance between 9 and 10), from the body draft. The width = 4″ (10 cm). 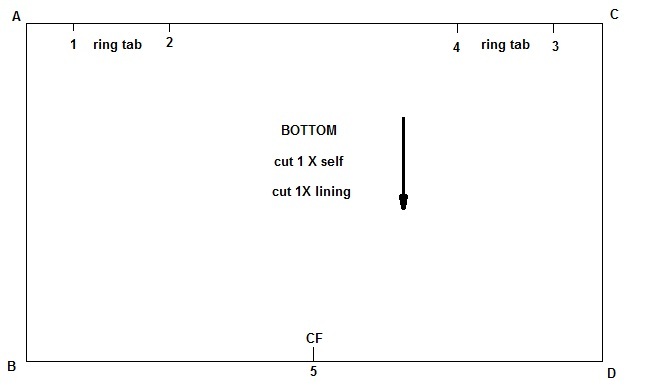 Label pattern, cut 1X self. Make shoulder strap from webbing. Cut 2 lengths of webbing 36 inches long (90 cm). Attach a buckle on one end of each length and turn-under the cut end. Stitch across the width of the strap to finish neatly. Set the pair aside. Make drawcord. Cut a strip of fabric 53” X 2” (135 cm X 5 cm). With wrong sides together, fold strip in half lengthwise and press flat. Open strip and fold in long raw edges to the center of the fold. Press flat. Refold strip and stitch close along open edge. Set drawcord aside. Make grab handle. Cut a length of leather using a rotary cutter (or x-acto knife) 12 inches X 2.5 inches (30.5 cm X 6.5 cm). Using an awl, score down the length on the wrong side of the leather. Place double-side mounting tape along the length of the leather strip on the wrong side. 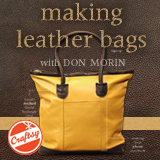 Peel off the paper coating from tape and fold the leather in half lengthwise. Machine-stitch (use a long stitch length) along the cut edge of the strip’s length. Set aside. Make leather clasp. Cut 2 lengths of leather using a rotary cutter 8 inches X 1.5 inches (20 cm X 3.7 cm). On one of the pieces, make a centred hole using a hole-punch, 3 inches (7.5 cm)from one end of the leather strip. Attach the stud portion of the snap set (receiving end) and rivet into the hole, following manufacturer’s directions. Place double-side mounting tape along the length of the leather strip on the wrong side. Peel off the paper coating from tape and place onto the other leather piece, with wrong sides together. Carefully round the short ends of the leather trim. Machine-stitch (use a long stitch length) along the perimeter edge of the trim. On the end of the trim piece without the hardware, make a centred hole approximately 1 inch (25 mm) from the end and attach the remainder of the snap set, with the dome stem coming through the hole so that the socket is facing upward on the same side of the trim as the stud portion of the set. Set clasp aside. Make ring tab. Cut 1 length of leather using a rotary cutter 6 inches X 3 inches (15 cm X 7.5 cm). Score along the length on the wrong side of the strip, 3/8-inch (10 mm) on either side. Place double-side mounting tape along the length of the leather strip on the wrong side. Peel off the paper coating from tape and fold the leather in half lengthwise. Machine-stitch (use a long stitch length) along the folded edge of the trim. Wrap the leather trim around the O-ring and machine stitch across the trim’s width, as close as possible to the ring. Trim any excess from the backside of the leather. Set aside. Iron on fusible interfacing to the wrong side of the front pocket flap and its lining piece. With face sides together, match and align the layers. Pin/baste along the straight edge of the flap and sew a scant 1/4-inch seam (6 mm). Press seam open. Iron on transfer web to the wrong side of the exterior portion of the pocket flap, following manufacturer’s directions. Center a 2-inch length of the hook side of hook & loop fastener vertically, on the face side of the lining portion, about 1/2-inch (12 mm) from the rounded edge of the pocket flap. Stitch in place. Peel the paper coating from the transfer web and with wrong sides together, fold the pocket flap in half (on the seamline) and match/align the rounded edges. Fuse the two layer together from the lining side while working around the loop fastener. Stitch along the curved raw edge to secure. Measure the curved edge of the flap and cut a 3/4-inch (20 mm) wide strip of leather equal to the measurement taken. On the wrong side of the leather, score down the center of its length and apply double-sided mounting tape. Peel off the paper covering from the tape and carefully wrap the raw edges of the flap. Machine-stitch in place using a long stitch length. Set pocket flap aside. Repeat the same procedure for the bag flap except, instead of the loop fastener step on the interior lining, attach the leather clasp to the exterior portion of the flap once the bag flap is completed. Make up front bellow pocket. Turn under a 1/4 inch (6 mm) double hem along top of pocket piece. Press and topstitch down. Center a 2-inch (5 cm) length of the loop side of hook & loop fastener horizontally, on the face side of the pocket. Stitch in place along the completed edge of the pocket opening. At each bottom notched corner, fold the pocket with face sides together and align seam. Pin/baste dart and sew each corner dart. Press seam to one side and topstitch along seam, face up to reinforce the darts. Turn under seam allowance and press flat. Set front pocket aside. Cut 2 strips of fabric, about 8 inches X 1 ¼ inches (20 cm X 3 cm) to make pocket welts. Fold each strip in half lengthwise, with wrong sides together, and press flat. With face sides up, align raw edges along side pocket opening and pin/baste in place. Stitch a welt to each the upper and lower side pieces. Grade seam allowances and press flat. Next attach zipper in place using a zipper foot, but before doing so, modify the zipper head. In most cases, you will have available only a regular metal closed zipper to purchase. Using needle-nosed pliers, carefully remove the pull tab from the zipper head and insert a metal connector ring in its place. Cut a 12-inch (30 cm) length of leather 3/8-inch (10 mm) wide and loop it through the connector ring using a cow hitch knot. Repeat for the zipper on the opposite side. To attach the zipper, center it along the welt of each side piece so that the zipper zips closed from the back of the bag downward to the front of the bag. Stitch in place. Align and match the lower side lining piece to the outer edges of the lower side of the bag. Baste in place. Along the upper side welt, pin the zipper tape to the top of the lining and stitch together. With face side up, topstitch along welt seams. Repeat this procedure for the opposite side panels. Set both aside. Make interior zippered pocket. On the interior of the backpack, the lining on the back wall features a zip pocket. Start by ironing a strip of fusible interfacing to an edge of one of the interior pocket squares. Cut the interfacing 11” X 2” (28 cm X 5 cm) and fuse it to the wrong side of the lining fabric. With face sides together, center the pocket lining onto the back lining portion, placing the pocket lining so that it aligns with the bottom edge of the back lining. Pin/baste in place. On the interfaced edge of the pocket lining, mark out an opening for the zipper about 1/4-inch wide (6 mm) and as long as the length of the zipper teeth. Stitch around this outline with neat squared corners, then slash through the middle of this outline and cut diagonally into each of the corners. Push lining through the cut opening and press opening flat to neaten. Align and center zipper face up behind the opening and pin/baste zipper in place. Topstitch around pocket opening to attach zipper in place. Make interior slip pocket. On the interior of the backpack, the lining on the front wall features a slip pocket. Start by folding the remaining pocket square in half, with face sides together. Sew up each side of the pocket using a scant 1/4-inch (6 mm) seam allowance. Press seams open and turn pocket right-side-out; press flat. With face sides of the fabrics up and the raw edges of the slip pocket facing upward, center-align the pocket onto the front lining portion, placing the folded edge of the pocket so that it matches with the bottom edge of the front lining. Pin/baste raw edge of the pocket in place. Stitch along the raw edge, using a scant 1/4-inch (6 mm) seam allowance. Trim seam allowance, if needed. Fold pocket up and press flat. Topstitch along the outer edges of the slip pocket leaving the folded side open. If desired, you can divide the slip pocket by stitching through its surface to create compartments for smaller items like cellphone, sunglasses, or wallet. Iron fusible interfacing to the wrong side of the bottom lining piece, following the manufacturer’s directions. With face sides together, pin/baste the base of the front and back lining sections to each long side of the bottom lining. Ensure that the zip and slip pockets are facing upward. Stitch each seam and grade seam allowances towards the front and back lining sections. With face side up, edgestitch the seam on the front and back interior portions. Next, add sides to interior; match and align one side section to each side of the lining to create a bag. Pin/baste and sew up side seams. Press seams open. Set interior lining aside. Iron fusible interfacing to the wrong side of the bottom bag piece, following the manufacturer’s directions. Cut 2 lengths of webbing, 4 inches (10 cm) long. Thread each length of strapping through a square connector ring and fold webbing in half. Stitch across the width of the strap to secure ring neatly. Attach each ringed tab to one long edge of bottom section, face up, and approximately 2 ½ inches (6.5 cm) from each short end. Baste in place. Set bottom section aside. Center the front pocket so that its opening aligns with the zip openings at the side of the bag (in this case about 6″ (15 cm) from the bottom of the front bag section). Pin/baste turned edges of the front pocket to the front of the backpack and edgestitch in place. Next, attach ringed leather tab. Center the leather trim on the backpack front section, about 1/4-inch (6 mm) above the front pocket opening. Machine-stitch leather tab in place with the ring facing upward. Add pocket flap by placing it lined side up, approximately 1/4-inch ( 6 mm) above the front pocket opening and ensuring that the cut end of the ring tab in sandwiched under the pocket flap to encase it. Double stitch along the straight edge of the pocket flap to secure in place. Fold down pocket flap. With face sides together, pin/baste the base of the back exterior section to the long side of the bottom of the backpack, with the connector ring tabs. Stitch the seam ensuring to catch the tabs in the stitching of the seam. Grade the seam allowance toward the bottom section and on the face side, edgestitch along the seam on the bottom section. With face sides together, pin/baste the base of the front exterior section to the long side of the bottom of the backpack. Machine-stitch the seam. Grade the seam allowance towards the bottom section and on the face side, edgestitch along the seam on the bottom section. Add sides to exterior; match and align one side section to each side of the backpack, with the side zipper pockets positioned to close in the direction of the front of the backpack. Pin/baste and sew up side seams. 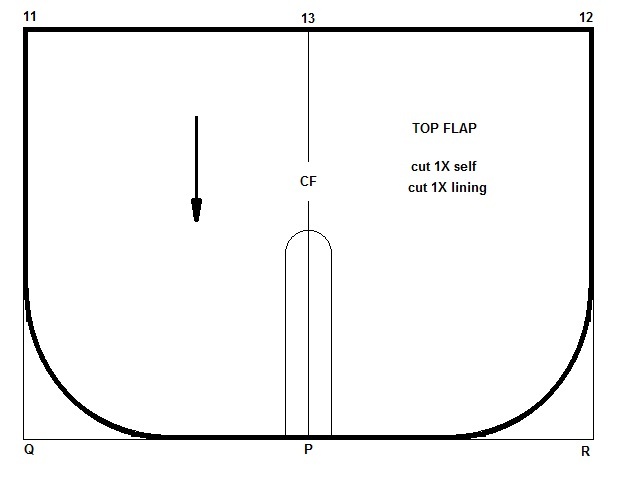 Grade seam allowances. Edgestitch along side seam, on front, bottom, and back sections to reinforce the seam. Iron fusible interfacing to the wrong side of the placket piece, following the manufacturer’s directions. Match and align the short ends of the placket, with face sides together. Stitch together to form a loop of fabric. Press seam open. Fold placket in half, with face sides out, and match up raw edges. Baste together and press fold. Edgestitch along the folded edge of the placket. With face sides together, align and match placket to body of bag along the raw edges. Pin/baste placket to bag opening. On back section of bag, thread webbing straps through the ringed connectors, then drawing though each buckle end of the strapping. Attach the cut end of the strap to the placket, approximately 4 inches on either side of center on the back section. Pin/baste in place. Between the two webbing straps, place each end of the grab handle next to the webbing and pin/baste in place. Sew around opening of the bag, catching the grab handle and webbing straps in the stitching. Turn the placket facing upward and edgestitch along the seam on the body portion of the backpack. Mark a placement location 1 ½” (4 cm) on either side of each vertical seam (8 in total) in the middle of the placket width and insert grommets (2 on each side), following manufacturer’s directions. Position bag flap along turned placket bottom edge, centred between the back sideseams, and double-stitch in place, through the seam allowance. Insert the lining by dropping it into the cavity of the bag. Align it so the interior zip pocket is on the back wall of the backpack and the side seams match up. Slipstitch top edge of lining to base of the placket to enclose the raw edge. Lace the drawcord through the grommets and tie a knot at the ends of the drawcord. I’m thinking of making a backpack using old cement bags which is a kind of canvas material & I’m wondering what type of needle should be used? This is exactly the information I was looking for & you’ve made it more possible for me to do! Thanks so much!! Thanks Cath…I would try using a Sharps size #16 or 18 sewing machine needle. It will allow you to use a heavy-duty thread such as upholstery thread for greater strength. This bag is similar to one made of leather I’ve been looking at for years. The $225 price tag is prohibitive so I’ll pickup a leather coat at SA & make this one! Thank you! Thank you Vicki. If you cannot score a used leather coat, you might also try the synthetic faux leathers available on the market. thank you so much for this great tutorial! I just started sewing with a machine maybe a week ago, so I’ll give myself some time and experience before I try this :). and I love the idea of using thrift store leather coats. Thanks T&T, there are many other recyclable materials along with leather coats at goodwill shops that are just waiting to be reclaimed by creative people as yourself. Thank you very much. You give invaluable information for free (my favourite price). 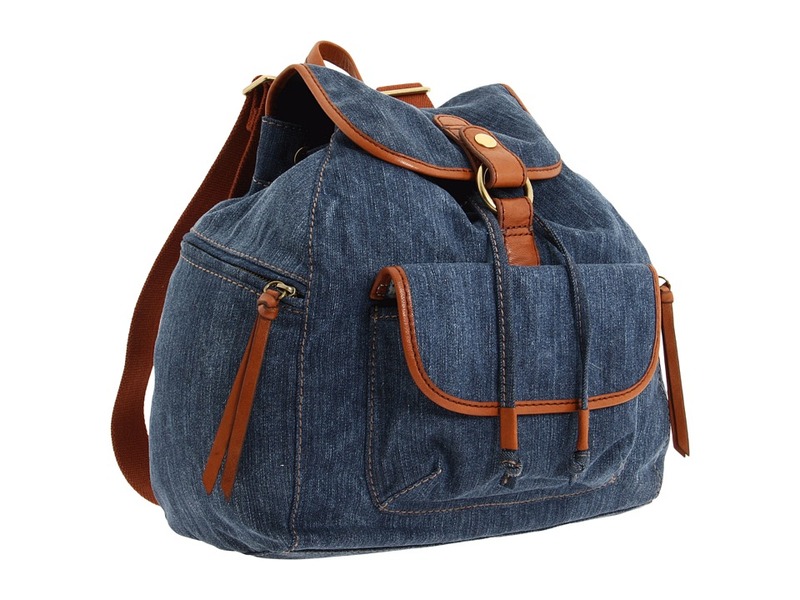 I really want to try this bag. I’ll get back to you sometime next year when I get me some courage enough to try! No courage needed Caje…what have you got to lose? Courage found and the 17- year-old loves the design. This is my next school holiday project. Yeah, they can cook too. Ahhh I get it, one day at a time. A fabulous tutorial, thank you!! I adapted the pattern a bit due to lack of leather, but here’s a link to the photos I took of my version of this bag made from an old pair of jeans! Bravo! Your backpack looks great. I think what you did on the interior is exactly what bag designers live for. Great work! Such a cool backpack! You have great sites here full of great projects,which inspire me all the time. Thank you for sharing your knowledge with us! I’m very pleased to uncover this website. I want to to thank you for your time for this fantastic read!! I definitely appreciated every part of it and I have you bookmarked to look at new information on your blog. Oh this is really nice Don! 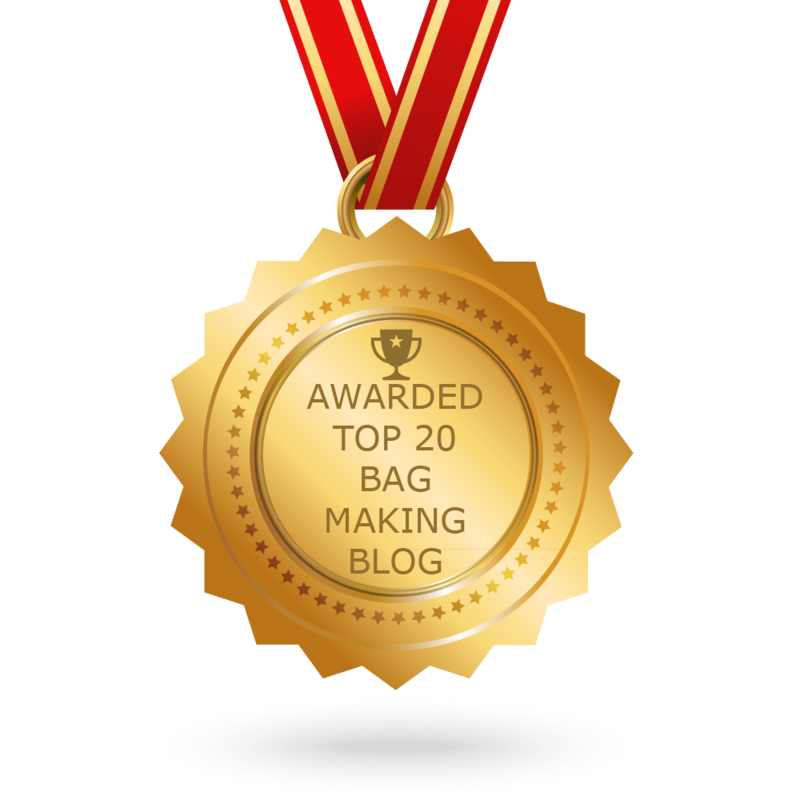 I’ve just entered your bag into this weeks bag Brag Tuesday linking Party at ChrisW Designs http://blog.chriswdesigns.com/2013/08/bag-brag-tuesday-linking-party-week-eleven.html 🙂 I hope you will stop by for a visit sometime! Hi I was wondering if you have a downloadable version of this bag. I want to make it for my daughter for school. My wife loves the look but has the same complaint as for most others she has seen. Too easy to access by someone behind you. She has a couple of older bags that have the main compartment opening against your back making it difficult for anyone to pick. Unfortunately she cannot find another like them. Wow, your pattern is incredible, just what I’ve been looking for! Thank you so much for sharing. I am wondering if it’s possible to scale this backpack down a little (from 30.5cm width to 25cm, etc.)? Would it make the whole strap part difficult and uncomfortable to wear? Thank you, Don! Happy new year. You are the designer, Hong…go for it. As far as comfort is concerned, try making a mock-up of your resized bag and test it out. Kath, AC is an arbitrary number to set up my draft. If you are increasing the size of your rucksack you may choose to make the rectangle for your grid larger/longer. Awesome bag? But I can’t seem to visualize the drawcord placket pattern. Thanks Martin. The drawcord opening is a faced opening that is stitched down, with metal grommets (eyelets) attached along the edge of the opening. This is my method of doing it, however there are many other ways to snitch up your backpack. Try it…make it your own design. thanks, don for the tutorial. i’ve been looking for this bag but i can’t find it. so, i think i’ll make it by myself. I say to myself that I have to make it. Thank you for this detailed pattern and description of this beautiful backpack. I only have one question about zip pocket in lining. 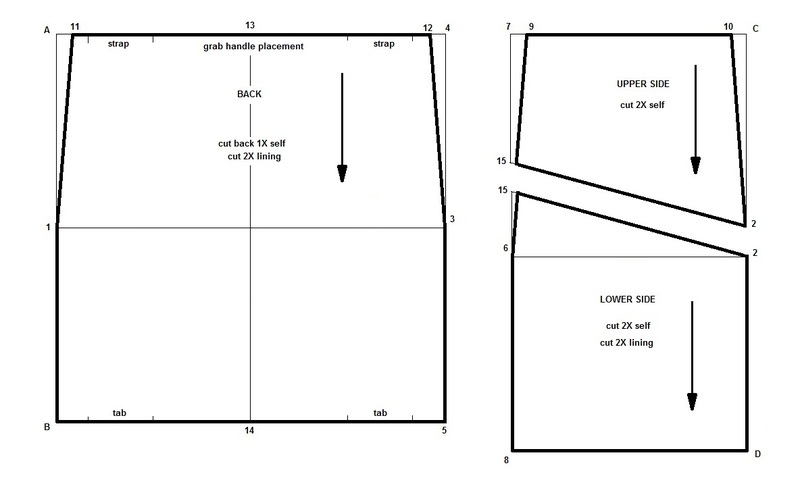 I cannot understand how this pocket should look and how to sew it to the back lining piece. 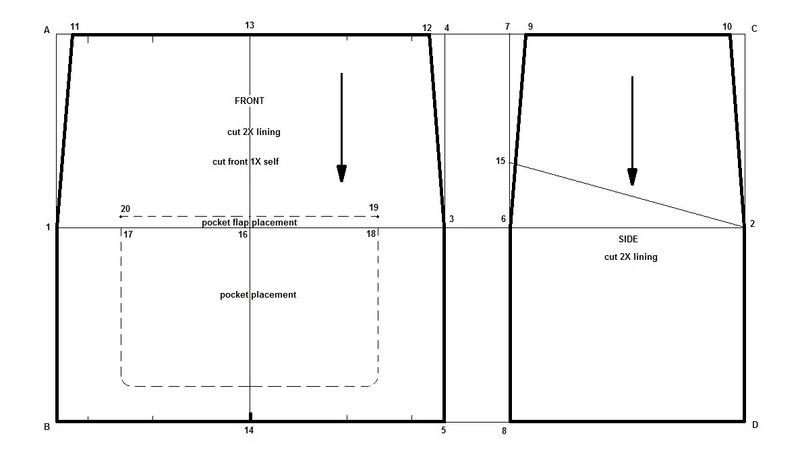 Could you please explain how should I place lining piece 28x28cm onto the back lining? And how to sew it? The zip pocket in the interior of the bag is a conventional inset zipper application with a pocket bag attached. Joanne at Craft Passion has a sewing tutorial to show you how to sew it if you don’t understand the given construction method (http://www.craftpassion.com/2010/04/sewing-tutorial-internal-zipper-pocket-for-bag.html/2). On the other hand, you can also cut the back lining in two horizontally and apply a zipper to the seam so that it runs side to side if the inset method is too complex. Either way, you decide what compartments go into your backpack to customize it. I would love to get this pattern at full size, is it possible and how much would it cost me. I am a leathercrafter with a industrial walking foot machine and I want to make one of these for me and maybe a friend too! Why pay someone for this pattern when I provide the draft for free? I think you are missing the whole point of this design blog. You need to wet the leather and block it into the curved shape you desire. I really love this design. I´m all ready to get to it. But I have a question…can this really be made on an ordinary domestic machine without needin a heavy duty industrial one? Thank you Claudia. Yes I made this on my little portable sewing machine. However I did do some tweeting. First, I changed the needle to a denim needle #16 and lengthened my stitch length. I find with the longer needle shaft that the denim stays free of being pushed into the feed dogs and the larger eye accommodates a heavy-duty thread more easily. Next I trimmed the edges with genuine leather (in my case pigskin). You will want to select a very thin hide of leather as a domestic machine is not very powerful to sew through leather. For the trim application, I used a leather needle (wedge #16). If I were to do it again, I would go thinner. Something like lambskin or goatskin. Some areas I was not able to stitch with the machine so I did it by hand using a glover’s needle. Try to keep the whole works flat for as long as possible so everything fits neatly under your machine foot, then close it up. You may find a dual-feed foot attachment helpful to advance several layers at once into the machine. This is a wonderful tutorial and exactly what I was looking for, thank you so much for taking the time to write it out! There is one thing I’m confused about, how do the drawstrings stay closed when pulled together? 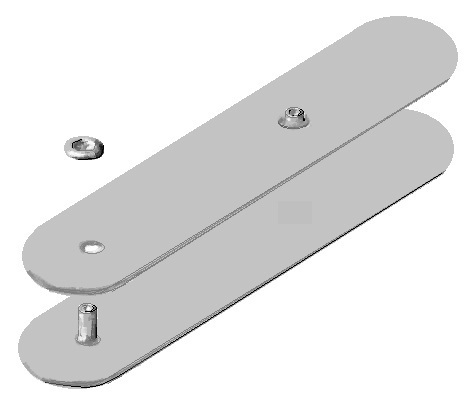 should I buy a fastener (no idea how they are called) or is there a way to make one? Thank you Edith. For my sample bag, I tie the drawcords ends together in a loose knot but you may certainly use a fastener.